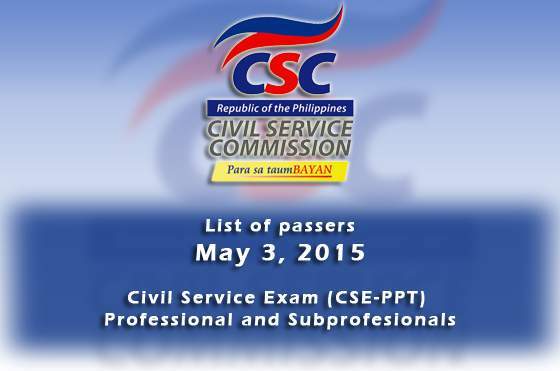 RESULTS: May 3, 2015 Civil Service Exam (CSE-PPT) – Professional and Subprofesionals - Balita Boss! The Civil Service Commission (CSC) released on Friday, June 12 the results of Subprofessional Level May 3, 2015 Civil Service Exam – Paper and Pencil Test (CSE-PPT) for Metro Manila or National Capital Region (NCR) or Region 13. The complete list of passers for Professional Level released on Monday, June 15. The examination was conducted by the Civil Service Commission (CSC) on Sunday, May 3, 2015 in testing centers across the country. The civil service exam, also known as Career Service examination, is a comprehensive exam given to those who want to work in government offices or agencies like GSIS, SSS, BIR etc. The exam is a general ability test designed to measure individual’s preparedness to enter government service. The Passing rate for the career service examinations is 80.00. According to CSC, a total of 180,680 took the civil service exam. The 157,041 individuals, comprising 86.92% of the total number of examinees, will take the Professional level of examination while the rest will take the Sub-Professional test. As general ability tests, the three-hour Professional level examination covers vocabulary, grammar and correct usage, paragraph organization, reading comprehension, analogy, logic, and numerical reasoning. The Sub-Professional exam, which lasts for two and a half hours, covers the same subject areas except analogy and logic, and also includes questions on spelling and clerical operations. The examination also covers the Philippine Constitution, the Code of Conduct and Ethical Standards for Public Officials and Employees (R.A. 6713), peace and human rights issues and concepts, and environment management and protection. Thank you for reading. Follow Balita Boss on Facebook, on Twitter or on Google+ to receive updated information about the Civil Service Exam Results.